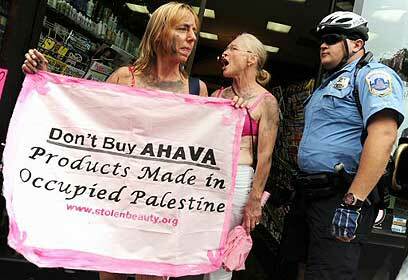 Green Olive Tours Blog • Palestine • Israel: Boycott Israel? The international movement calling for boycott, divestment and sanctions (BDS) against Israel was inspired by its South African counterpart, which after decades of struggle is said to have been a major player in the process of successfully dismantling the South African Apartheid system. Whether or not BDS against Israel is a justified and effective tool to end the occupation is very contested. In the following we will give you some background information to the debate. The South African Boycott Movement was founded by South African exiles and their supporters in London in 1959 and initially called British consumers to withdraw support from apartheid by not buying South African goods. A few years later a call for academic and cultural boycotts, as well as for disinvestment followed. 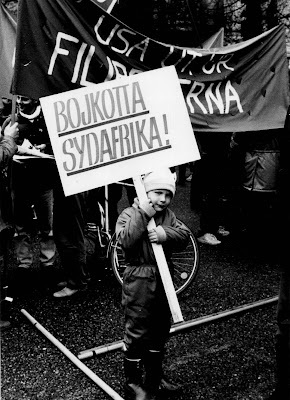 Although it took more than 25 years between the first call for boycott to the final reaction of the international community in the mid 80s, the movement already achieved some major victories in the 1960s. In 1961 South Africa was forced to leave the Commonwealth. In 1962 the UN called for imposing economic and other sanctions on South Africa, which at the time, however, was more of a symbolic gesture as hardly any state followed the call. In 1964 South Africa was suspended from the Tokyo Olympics and in 1970 the state was completely expelled from the games. Finally in 1986 the Republican controlled U.S. senate voted for the Comprehensive Anti-Apartheid Act, which "banned new U.S. investment in South Africa, sales to the police and military, new bank loans, except for the purpose of trade". The work of activists, human rights organisations, students' associations, trade unions and others was finally rewarded in 1994 when the Apartheid regime was dismantled through an electoral success of the African National Congress. While it has been only recently that the apartheid analogy seems to have gained momentum, its origin goes back to the 1960s and was first publicly used by none other than Hendrik Verwoerd, then Prime Minister of South Africa and widely regarded as the architect of its apartheid system. Israel at the time voted against South African apartheid at the UN. Verwoerd dismissed the vote by saying that "Israel is not consistent in its new anti-apartheid attitude... they took Israel away from the Arabs after the Arabs lived there for a thousand years. In that, I agree with them. Israel, like South Africa, is an apartheid state." After the Oslo Accords and the subsequent establishment of a system of tight control of Palestinian movement, but especially with the onset of the construction of Israel's Separation Barrier, the apartheid analogy started to be more commonly used. By now it is no longer only applied by activists, but also by some UN officials, politicians, intellectuals and artists, including Jewish Israelis. Proponents of the analogy usually point to a number of factors, such as Jewish-only settlements, separate roads, military checkpoints, as well as inequities in infrastructure, legal rights and access to land and resources between Palestinians and Jewish Israelis. Opponents of the analogy, on the other hand, often argue that while some similarities may exist, the motivation as well as the historical context of Israel's policies are completely different. They commonly point out that while Israel itself is a democratic and pluralist state, the West Bank and Gaza are not part of its sovereign territory and must therefore be treated differently. Many of those rejecting the apartheid analogy also criticise the Boycott, Divestment and Sanctions movement as discriminatory and unjust because it relies on a false analogy. Yet, just as both the situation in Apartheid South Africa and in Israel are way more complex than any analogy may suggest at first sight, also the pros and cons of BDS, the arguments of its opponents and proponents, as well as its diverse forms of implementation necessitate a more thorough analysis. Boycotting Israeli goods is not a new tactic in the Palestinian struggle. As early as 1922, hence 26 years before the foundation of the State of Israel, Palestinians called for a boycott against any Jewish business operating in Mandate Palestine. In 1945, through a call by the newly formed Arab League Council the boycott was severed and extended to other Arab states which were summoned "to refuse to deal in, distribute, or consume Zionist products or manufactured goods". While in the past this boycott was observed by the entire Arab League, today it is only Lebanon and Syria that adhere to it more stringently. Many other Arab countries however still refuse to allow entrance to anyone who uses an Israeli passport or who has an Israeli stamp in their passport. During the early years of the First Intifada, the Palestinian United National Command for the Escalation of the Uprising in the Occupied Territories (UNC) instructed residents to boycott products from Israel, to organise strikes, resign from government and police positions and to refrain from paying taxes to the Israeli government among other things. This campaign of non-violent civil disobedience proved to be successful and Israel is said to have lost approximately $1 billion as a result of the Palestinian labour strike, the boycotted goods and the refusal to pay taxes. Eventually, however the resistance was crushed and the old PLO leadership returned to be in charge of the uprising, which eventually ended it in 1993. 3. Respecting, protecting and promoting rights of Palestinian refugees to return to their homes and properties as stipulated in UN resolution 194. The PACBI call was endorsed by many individuals, including international artists and intellectuals, as well as by trade unions and other organisations. 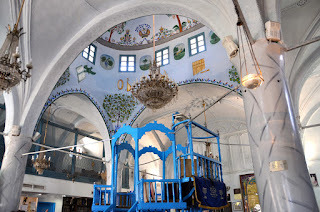 A group of Palestinian and Jewish citizens of Israel also joined the call and formed Boycott from Within which became an important voice within the movement. Artistic Boycotts: Numerous renowned international artists have and continue to cancel their scheduled performances, or participation in festivals in Israel, including Dustin Hoffman, the Pixies, Brian Eno and Massive Attack, to name just a few. Boycotts of Israeli Companies: In 2011, Agrexco, Israel's largest exporter of agricultural produce went into liquidation with debts of €175 million, with many reports attributing the company's bankruptcy at least partially to the global boycott of its produce. Disinvestments: In 2011 following pressure from German lawmakers, the German Rail Company Deutsche Bahn decided to withdraw from a project to build a rail link between Tel Aviv and Jerusalem as the rail link is supposed to be cutting through the West Bank. As opposed to the full scale boycott promoted by PACBI, the boycott of products stemming from Israeli settlements in the West Bank, as well as of Israeli and international companies that benefit from the occupation of Palestinian land, is much more acceptable to many, including accredited organisations, such as the World Council of Churches. Also in Israel, a majority of left-leaning citizens support the boycott of settlements, as shown in 2010, when 60 of Israel's most prominent actors, writers and directors publicly announced that they refused to take part in productions by leading theatre companies at the new cultural centre in the West Bank settlement of Ariel. The Israeli project Who Profits? is probably one of the most prolific information sources on corporations profiting from the Occupation. Notwithstanding the wide consensus on the international left, many governmental bodies, such as the EU are still showing ambiguity on the issue. While maintaining that the settlements are illegal under international law and constitute an obstacle to peace, the EU still provides a primary export market for settlement products. Although the issue has been discussed many times, the EU, as opposed to individual countries, such as the UK, is still far from even issuing clear labelling guidelines to ensure European consumers do not unknowingly buy settlement goods. The most obvious criticism is the claim that the BDS movement is promoting a delegitimisation of Israel. 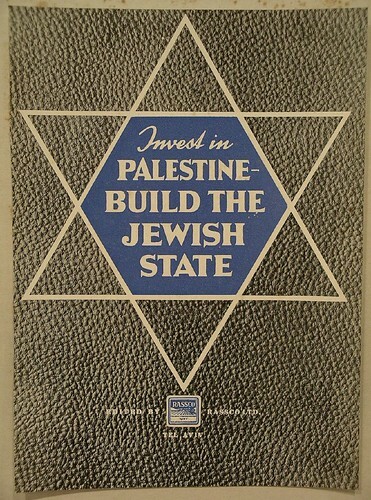 In 2011 the Israeli government implemented a law that criminalises "individuals or organizations who publicize a call for an economic, cultural or academic boycott against a person or entity merely because of its affiliation to the State of Israel and/or to an Israeli institute and/or to a specific region under Israeli control". Although still in effect, a number of Israeli civil society organisations have recently filed a petition against the law in Israel's High Court of Justice, claiming that the law is infringing on the constitutional rights to freedom of expression and freedom to protest. By the time of writing the High Court has issued an order nisi, ordering the state to justify the legality of the Boycott Prohibition Law. Criticism also comes from those who are known to support the Palestinian cause, including prominent critics of Israel's policies, such as Noam Chomsky and Norman Finkelstein, who call the BDS movement hypocritical in its sole focus on Israel whose crimes, according to Chomsky, only constituted "a fragment of US crimes, which are much worse". Playing into the critics' hands are those supporters of BDS who do not seem to be able or willing to follow the guidelines of PACBI and who cross the line between boycotting individuals, companies and institutions that are directly linked with, sponsored by or represent the Israeli state and those that are simply Israeli or just Jewish. Targets of those worrisome acts involved even individuals and organisations that have a clear anti-occupation stand. Such behaviour is in line with the criticism that BDS amounts to anti-Semitism and that the attempted isolation of the Israeli state shuts down communication rather than opening it. It still remains to be seen whether BDS will be as successful as its South African predecessor. Surely, with the internet, and especially with social media networks, as well as new creative tactics such as flashmobs, the movement is gaining prominence much faster. The fact that Israel has implemented a law against the boycott also shows that the establishment perceives BDS as a real threat that needs to be acted upon. 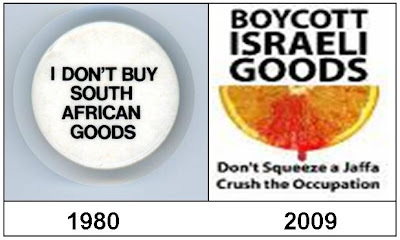 On the other hand the boycott of Israel seems to be gaining prominence predominantly internationally, while a majority of the Palestinian population, unlike black South Africans at the time, only endorse it in theory while in practice they continue buying Israeli products and providing their labour force.